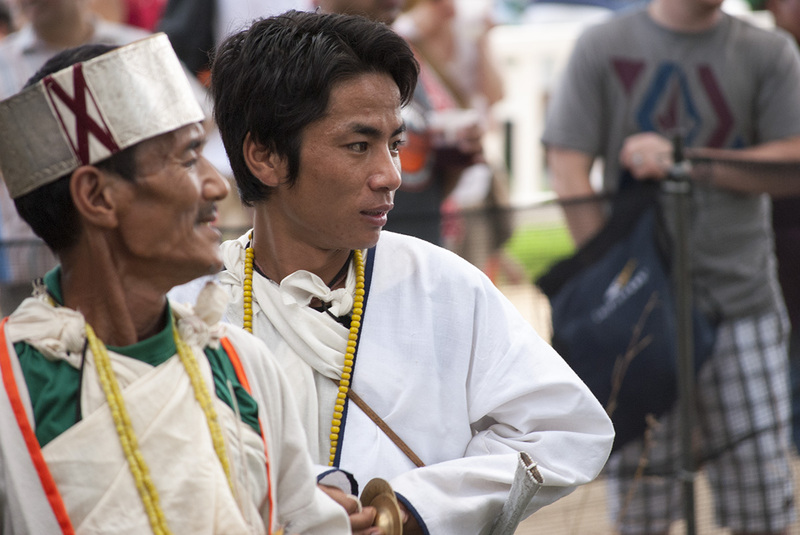 The Smithsonian Folklife Festival took place over two weekends on the National Mall in Washington, DC. I’m lucky enough to live in DC, so it was just a short bus ride for me to get to spend a whole day exploring the “One World, Many Voices” program. The program participants had much longer journeys, having traveled from such far-flung locations as Hawai’i, Colombia, Russia, and Bolivia. One group, the Koro Aka speakers of the Himalayan Mountains of northeastern India, had to travel for nine days to arrive at the Festival – a trip that involved taxis, buses, more taxis, and connections through four different airports. Allison Taylor-Adams interviewing Sorsomi Degio and Bhokta Newar. The Koro Aka live among a group of people called the Hruso Aka, or Aka. According to Khandu, the Koro and the Hruso share many similarities – “the way we dress, the way we celebrate our festivals, the way we cultivate our farms…[in many things] we may be very similar – except in our language.” While the Hruso Aka are a fairly large tribe, made up of over 30 different clans or “family names”, the Koro Aka are much smaller, with only 4 family names. Khandu Degio performing a Koro dance, with Ramda Degio in foreground. Sorsomi Degio is employed by the Indian government to teach school to the youngest children in the community. She says she teaches in Koro Aka and Hindi, but all of the texts for school are only available in Hindi and English. When I asked her and Bhokta if they wanted Koro Aka to have a writing system, they both said “yes!” simultaneously. Sorsomi said that illiteracy is a problem in the Koro Aka community, and Bhokta said that roughly 70% of Koro Aka are illiterate, but added that “nowadays people are giving much more emphasis on education.” Sorsomi said if she would love to be able to use written Koro Aka in her lessons. This echoes Khandu’s feelings. He said that he hopes that many students will be able to study in the Koro Aka language, and hopes that the coming generation will have texts in Koro Aka. Sorsomi Degio singing at the 2013 Smithsonian Folklife Festival. 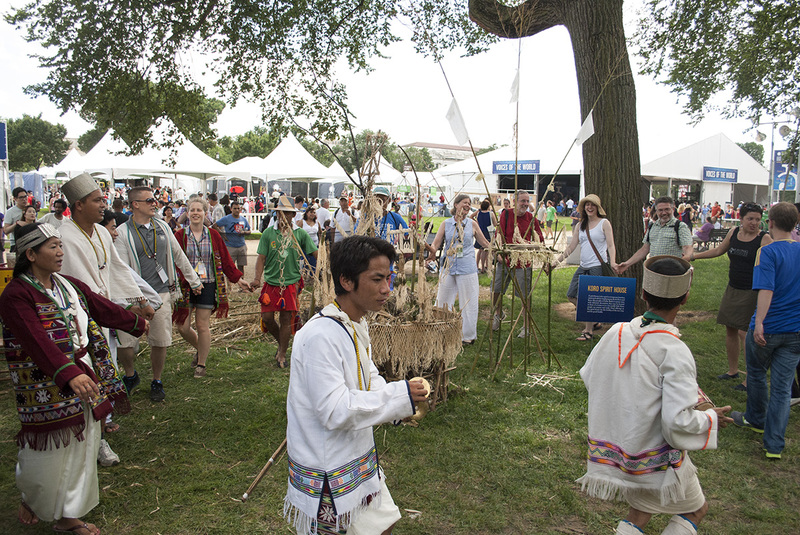 Koro Aka Spirit House Celebration at the 2013 Smithsonian Folklife Festival. About the Author. Allison Taylor-Adams has bachelor’s degrees in Religious Studies and Russian Language and Literature from the University of Oklahoma, and has just received her master’s degree in Applied Linguistics from the University of Massachusetts-Boston. She blogs about languages, language learning, and linguistic diversity at Polyglossic. She also loves lace knitting and hiking in the woods, both of which are activities that can conveniently be accomplished while also talking and thinking about languages. Thanks to Ms. Taylor-Adams for her wonderful guest blog post, and to Aaron Adams for the the photos! The Koro Aka language has been a priority for linguists Dr. K. David Harrison and Dr. Gregory D. S. Anderson in part because, prior to their research, it was not acknowledged or listed in the scientific record as a distinct language, nor were any recordings available. Koro Aka remains a mystery in terms of its position within the Tibeto-Burman language family. Harrison and Anderson’s comparative work will help scientists understand where it fits and how it has evolved within the Eastern India Language Hotspot. Click here to learn more about the Koro Aka. 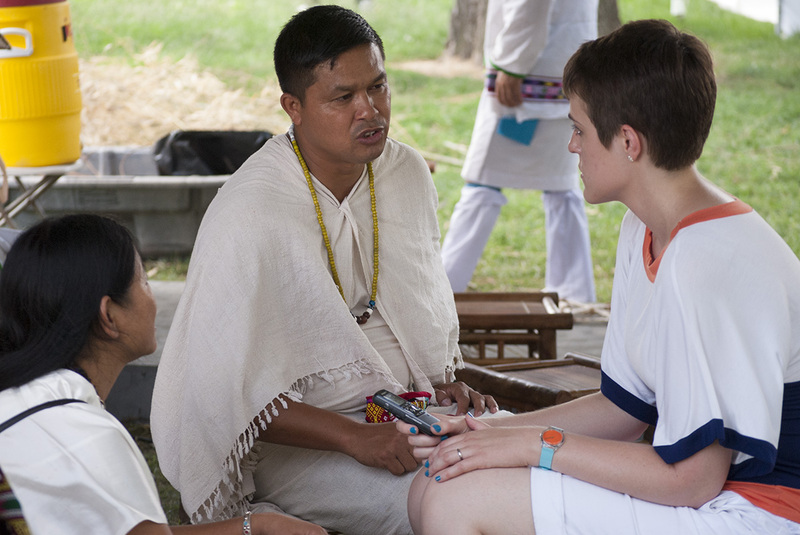 This entry was posted in Endangered Language Activism and tagged 2013, Allison Taylor-Adams, arunachal pradesh, endangered languages, hruso aka, India, koro aka, Polyglossic, smithsonian folklife festival, Washington DC by livingtongues. Bookmark the permalink. Thanks for informative post. I’m pleased positive this post aids me help save many hours of searching other similar posts only to find what I had been looking for. Only I want to point out: Thank you!